Oktay is back once again, this time with some offers for his brands VPSDime and Winity.io. Recently, VPSDime expanded to introduce some high-storage offers which give you storage at Backupsy pricing but with more RAM. Winity.io has expanded to Los Angeles since we last featured them. Oktay and his brands are known for the custom control panel they all utilize, always fully integrated into the billing area. No double logins and no SolusVM to have to fool around with. VPSDime nodes have a variety of configurations but they each have 384GB of RAM, at least 8 drives in RAID10, and either dual Intel Xeon E5 2620 or dual Intel Xeon X5660/L5640 CPUs. SSD caching is available in Dallas only. Disk space in Los Angeles is full SSD. The storage nodes for VPSDime are configured with dual Intel Xeon X5650 CPUs, 128GB RAM, and 12x 4TB hard drives. VPSDime offers come with a free MySQL offloaded account in Dallas, where you’ll get 20GB of space, and free daily backups with an option to self-restore. Winity uses host nodes with redundant power and network, dual Intel Xeon E5 2660v2 CPUs, 384GB RAM, 8x 4TB hard drives in RAID 10 for strage, and 4x 128GB SSDs for caching. A full, legal, non-trial Windows license is included in the price. Reviews are predominantly positive. As always, please share your experiences with them in the comments! VPSDime and Winity.io accept payments via PayPal and credit and debit cards via 2Checkout. VPSDime VPS are allowed to do pretty much everything except BitTorrent, TOR, Public VPNs/Open Proxies, MineCraft Servers, CamFrog, Digital Currency Mining and illegal activity. VPSDime storage machines are allowed to run torrents via private trackers, but not via pulic ones. The full ToS are available here, be sure to read them before you order! Winity.io VPS are not allowed to do BitTorrent, TOR, Public VPNs/Open Proxies, MineCraft Servers, CamFrog, Digital Currency Mining and illegal activity. Their ToS is available here. UK still on ?? Or Withdrawn ?? Only Storage plans have UK location. Our regular high ram vps does not have UK location. I purchased a product I would like to try.. how long it ta ready vps 6gb uk? I had their service for a while. 1) Their host OS has an app killer looking for “prohibited” services running which prevents them from running on the guest. rsyslog is one I needed, but why would they kill that? Makes no sense. They told me to just “rename” it. Not something you can just do when using repos to make sure you keep updates with. 2) To upgrade your service with more capacity, you have to order double the service. We no longer apply that policy. You can use rsyslogd without an issue. I’m sorry for the trouble. Since private torrents are allowed, how about iroffer? [DDL through IRC or known as XDCC bot]? Just curious before paying the Storage VPS. Please submit a sales ticket and we’ll look into it. I notice you say torrents must be capped at 50mbit… Are there any plans to allow between 80-100mbit? Seems a little low, considering each VPS states it has 1gbit connectivity – 100mbit shouldn’t be a problem, surely? 6GB mem, 4 vCPU, only $7/mo, what a monster! Free offloaded MySQL is awesome, also! Full disclosure: I had some speed issues with the LA location and wound up moving that VPS to NJ. It’s not capped on the 500GB or bigger plans. We do not recommend you running web server on them but you are free to do so. Just note that we do not backup them or have any disaster recovery plan in place since they are basically designed for storage and backups anot nothing else. Our high ram plans are fully production ready, however with daily backups with self restore options and free offloaded MySQL. Does free offloaded MySQL comes with Los Angeles location also or is that only for Dallas location? Only for Dallas for now. Thanks, in case if you offer this in LA location later, can I switch location? I ordered one VPSDime High Storage at Dallas location but was unable to request for Offloaded MySQL, support told me that its storage VPS product and not eligible for offloaded mysql. That was not clear to me from the description and your response above. Is there anything you can do to help with that? They are in different DCs unfortunately. Not off to a terribly good start, just bought one of the high memory VPS, the PayPal payment went through without issue, but then they promptly cancelled the order without any explanation. Justin, just replied your ticket. Your order has been cancelled because of a misclick. Nothing personal. Sorry about the issue. Using Winity 4GB, VPSDime 6GB and 1TB storage, all very fast and 0 downtime. Extremely happy customer over here! Whats your refund/cancellation policy, do you issue pro-rated refund if I signup for annual payment? We have a 3 day full refund policy. Is self use torrent allowed ? I use the vps to download videos and then transfer to my computer.No upload. Yes but only on private trackers. Sorry to be blunt but that sounds incredibly retarded. Use something that is actually meant for backups. Completely agree. I recently paid the price. My seedbox got hacked. I was also backing up personal photos/docs. Fortunately it was all encrypted (my photos and docs). I was screwed otherwise. Never again. Let’s face it, seedbox is shady stuff you like it or hate it and keep other things from your life as far away from it possible. Check Bittorrent Sync. It’s made for it. You say torrents are allowed. and then the page forgets about torrents altogether. These guys are just awesome, I already have 4 plans with them including 1TB storage, and plan to order a few more plans soon. Servers are excellent and have not had any issues so far. Why my order is refunded? It’s fixed it seems. Let us know if you need anything else. purchased a winity.io windows basic a few minutes ago. I clicked “United Kingdom” although in the article the locations are only Orlando & Los Angeles. How long does it take to setup? Status is still unpayed..
Should be deployed after the manual screening. I don’t see any pending orders at the moment. Let us know if you need anything. Hey VPSDime, do you accept Bitcoins? I use Bit Torrent Sync. I’ve got to say, it’s a novelty to have a backup VM with enough RAM. Makes quite a nice change. Also nice to see up to 20MB/s transfer rate on the initial sync. I had 2 vps from Winity..
1 in LA and other in UK..
Just curious to know what configuration you have and does windows work well with only 1GB RAM or should I go for 2/4 GB RAM? All my windows server from winity only had 1GB RAM,i only did standar config for my used..
it depends from user who use it for what reason.. I signed up. Got a paid invoice and a welcome message. Should have mentioned signed up for Winity. You should receive another mail shortly. I’m in the LA area and when I ping the LA location, I get higher result than expected. I usually get 10ms/12ms avg with other providers. BTW, the looking glass for LA is not working. Typo it seems. Thanks for noticing. Under Downloads I see: The download library has all the manuals, programs and other files that you may need to get your website up and running. But there is nothing there. Should there be docs here? Also Knowledgebase is empty. Should there be docs here? Can you point me to some useful references on how to get started? Well, there is no documents at the moment since the service offered is self-managed and the FAQ on the homepage mostly covers things. We will however create a knowledge base soon. I could’t miss this 6gb RAM offer so I ordered immediately, then my machine was created within few minutes. Is it possible to upgrade the storage? VPSDime – $1 per 10GB – Winity not at the moment. Here you said “VPSDime storage machines are allowed to run torrents via private trackers”, but the first line of the full TOS is “Torrents, TOR, Mining, IRC, Teamspeak, Minecraft, Starbound, Runescape and Chobots are not allowed”, so are private tracker torrents allowed or not? They are allowed on High Storage Plans. Is it possible to combine multiple high storage plan into a big storage? I guess you can just buy one with more storage space from their website, its the same price on website too. What DC is being used fro the UK location? All new orders in Orlando are deployed in pure SSD server. So, If I choose UK, will you move to ssd at some time? or it wont affect already taken vps? Sure, we can move it to SSD when the new nodes are deployed. We are going to live migrate everyone on the old nodes to new SSD nodes soon. I’m thinking about the high ram plan, in Dallas. I am thinking about running a private sip and VPN server for my own use, is that allowed? I realize public vpn services wouldn’t be, but doesn’t say anything about private VPN’s or SIP servers? Also, is there anything extra required for us to do to have PPP enabled? or is that enabled by default? Sure, your use case is perfectly acceptable and allowed. We can enable PPP for you. We will add Stripe soon. I think you should add bitcoins for a payment. I currently use your service and am quite happy with it but I have to convert my bitcoins to paypal which is annoying. Been using two of their VPS (LA and TX) for the past couple months and they work great. Definitely recommended. The offloaded MySQL had some hiccups and lag in the beginning, but it’s been fine since. Request: Support multi-node access to the same DB on the offloaded MySQL server. It would be very useful for redundant and/or failover web serving. I’d be OK if it required setting it up via command-line only. can i use VPS High Storage for download and upload ? I’m sorry, that’s not allowed. Can you say what the 4 vCores are in the storage offer in the UK? Also, is it possible to get the offer for a short time, like 1 month, to test, and then move on to the yearly plan, same conditions (70$), recurring? UK Storage has E5 2630v2 cores. Sure, that’s absolutely fine. serverian: do you have 128mb or 256mb plans available in amersterdam? We do not supply low ram plans anymore unfortunately. 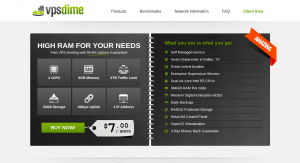 Purchase a 500GB storage in Dallas from VPSDime. Support is very friendly and responsive, had to contact as my order wasn’t provisioned immediately and also contacted to enquire about the possibility of a UK location. It does seem though that VPSDime Storage products are using SolusVM Control Panel and not any custom panel as mentioned in the post here. I’m not a guy for change though so Solus is good for me. I’m glad you are happy! Let us know if you need anything. Jumped on board and been using Vpsdime the past few days and pretty impressed. Support pretty active and reply quickly. Had an issue with their billing and was quickly resolved. Very good pricing. Your business is appreciated. Enjoy your stay! There is no option for credit cards via 2checkout, only paypal is there. I want to order a winity package. Please let me know. I’m sorry. We do not support anything other than Paypal at the moment. We are going to add Stripe soon. Ok, that means I can’t sign up with you because PayPal is not available in Pakistan. I had paid with credit card to ramnode, crissic and vpscheap and I had 3 vpss’ so far. If there is any alternative way like moneybookers then let me know. Any chance of getting another payment gateway anytime soon? Paypal is not available in all countries.. Agreed, there should be some alternative method of payment. Will this 500GB HDD offer still be valid in a month? I’ve just paid another month with my existing VPS, but definitely want to move to VPSDime. Sure, it’s our standard plan. Unfortunately i have to disagree with most of the review, i tried to purchase a high ram (12gb) server twice, the first time it was refused, had a kind of explanation from support but wasnt exaustive and i was offered no option. basically i live in australia but my paypal account is italian, as thats whre i am from. The purchase was canceled due to the difference between my actual address and the paypal address. i did a second purchase and same story but had no answer from support. all i wanted to do is run a gns3 remote platform to train from my office since i cannot install app on my pc, and i payed with my professional verified paypal account i own since years. i cannot understand all this problems with the payment. I had the same issue when I lived in USA, I’m from Barcelona (Spain) and I used to use pretty often Paypal, but no one in USA accept me payments using my spanish account. After a while I just realised that the solution was quite simple, I just had to open a new USA Paypal account and introduce the information of my american debit card. This fixed the problem! I hope this helps you to fix it. I use VPSDime with a very small VPS since a couple of weeks and the experience has been very positive. if VPSDime High Storage’s 4TB bandwidth use out,can i continue to use? I always recommend this guys. Support and service is absolutely incredible! Just cancels without any explanation. I guess they don’t want paying customers. If we find some anomaly with your personal information or got notified by our third party screening partners, we do cancel and refund the order. Nothing personal. There may be some false positives as nothing is 100% fool-proof. Our screening process is there to protect ourselves and our customers. Maybe if you would notify the person and tell one what the problem is, and ways to fix it, you could probably avoid negative responses on here, and have happy customers. Exactly, they should at least notify us so we can backup our data and maybe try to solve the problem. It’s very unprofessional to suspend a service without a prior notice may it be for any reason whatsoever. Winity.io provides Windows VPS, others are Linux/Debian VPSs. I want to buy Windows VPS. Shall I buy from the link and apply the coupon? Big Scam. DDos any time and service suspended. You should learn the definition of scam first. If you send DoS attacks, you’ll be kicked out like any sane provider would do. If you receive attacks continuously, you’ll be kicked out. Yesterday, before ordering one of your vps, I asked your sales team if I can run a web crawler (e.g. OpenSearchServer), and he told me it is fine, so I ordered a vps and installed a crawler. This morning I tried to optimize the settings of my crawler but cannot access the front-end, I checked my VPS status and found out that my vps is cancelled, care to share some explanation? Brian, it seems there was a human mistake made while cleaning the fraud/pending orders. I can see that it’s been explained to you. Your order was still appearing as pending even though it was approved. That’s why this happened. I sincerely apologize for the issue. We are going to make sure mistakes like these never happen again. how many free ip’s do you provide with the 6GB high Ram VPS? I’m sorry but we do not offer any management services. Coupon expired.Could you arrange new one ? Do they still offer Windows? Can’t see any Windows offers for $7. I am confused. When I attempt to order a Storage server I can only choose the UK even though the UK is not mentioned anywhere on your website. Just make sure that you are okay with OpenVZ. It can have some issues with some of the newer applications such as docker. From what I understand, the OpenVZ kernel will be updating soon which should alleviate these issues anyway. I am just running another VPS to host those applications and the Dime to host the rest of the services. Our website is hosted on another network and had a node failure and has been moved. It was down about an hour. Our nodes have been online all the time. Hello the storage vps is only at uk now will you have usa locations in the future? or if i choice the uk can you change me to usa port when you have available? We are temporarily out of stock for storage vps line in the US. We can terminate and recreate in the US, but can’t do a migration. Website is not public, We are share them in group private. If you own the copyright on the files, sure. If not, sorry. What about storage redundancy in your Storage Plans? You mention that you dont have any disaster recovery, but do you have at least a RAID1? Looks good, but the promocode is not valid anymore. @serverian, what’s the availability for LA storage vps’s? Currently, one can only order for your UK location. We are temporarily out of stock for storage vps line in the US. Do some research. It uses too much CPU and is not ideal for OVZ. You’d need a dedicated server if you don’t want your neighbors complaining about hogging all the resources. Do you provide a private IP? I mean I want to setup a high ram front server and a storage for saving file. Can I know how much is additional IPv6 and IPv4? VPSDime High Memory does not offer Windows anymore? Well, the promotional code has expired. Tried to apply LEBJUNE as promo code, says it’s expired? not happy with vpsdime .